It's Not Work, It's Gardening! 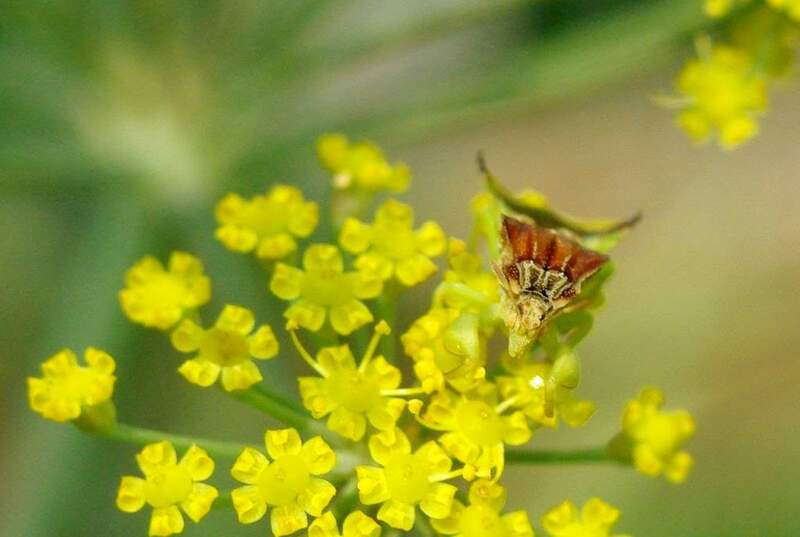 : Fennel Flower Ambush! This spring when I redid my vegetable garden and made raised beds, I knew the east edge of the garden would be a problem. That's because I have bronze fennel growing there, the only perennial inside the fenced veggie garden. It's growing in the east-most walkway which is minimal already, and I knew it would be trouble once it reached its mature size later in the year. 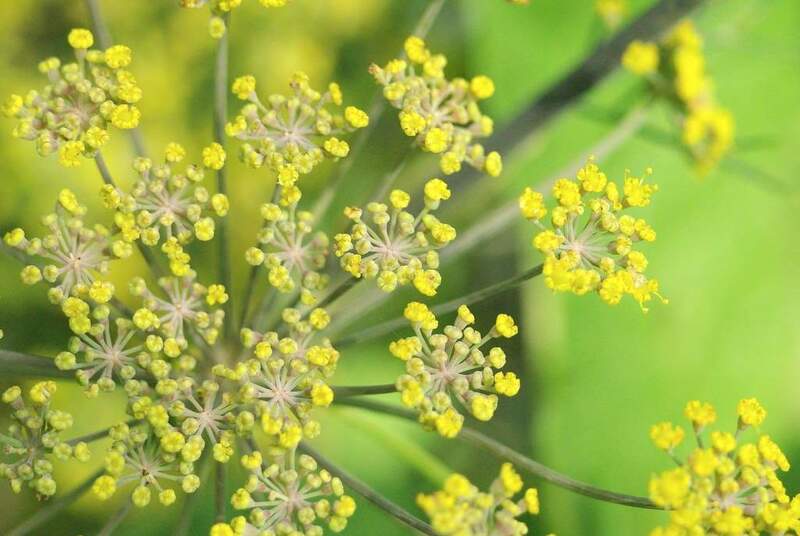 Well, it's later in the year now and although I should have staked up the fennel a month ago I've let it flop over a couple of the raised beds. This isn't too much of a problem right now as there's not too much growing here right now, except for a volunteer bean or two, some volunteer epazote, and zucchini squash that I never seem to have success with. 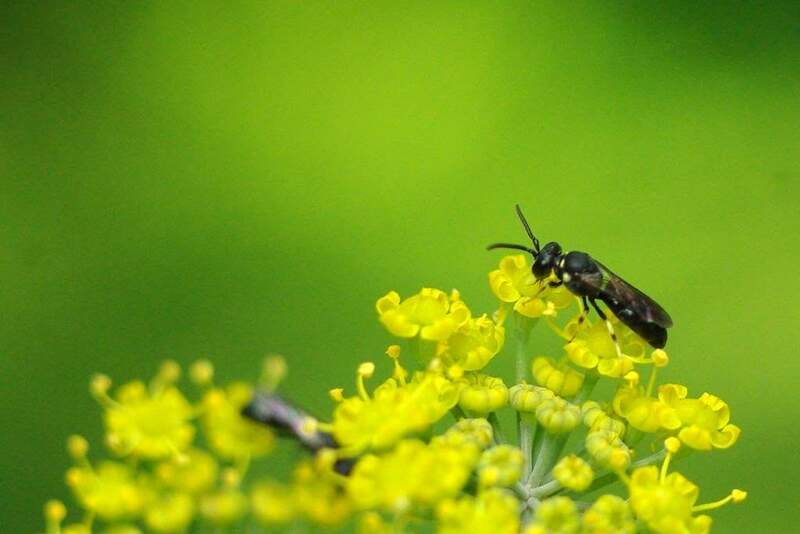 Having the fennel plants leaning over has given me easier access to the flowers though, and that opens up a world of discovery, as the flowers are alive with insect activity. 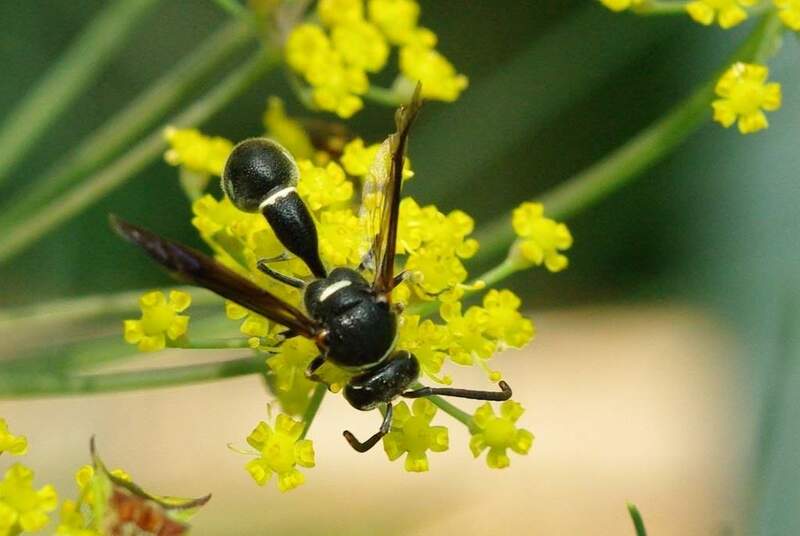 I thought this one might be predatory, hunting for the pollinators visiting the thousands of tiny blooms, but then I saw it landing on the flowers themselves, ignoring the other visitors. A little time at bugguide.net told me that it was not in the mantis family, so I went to "what's that bug" and read over the list of bug families in the left column. 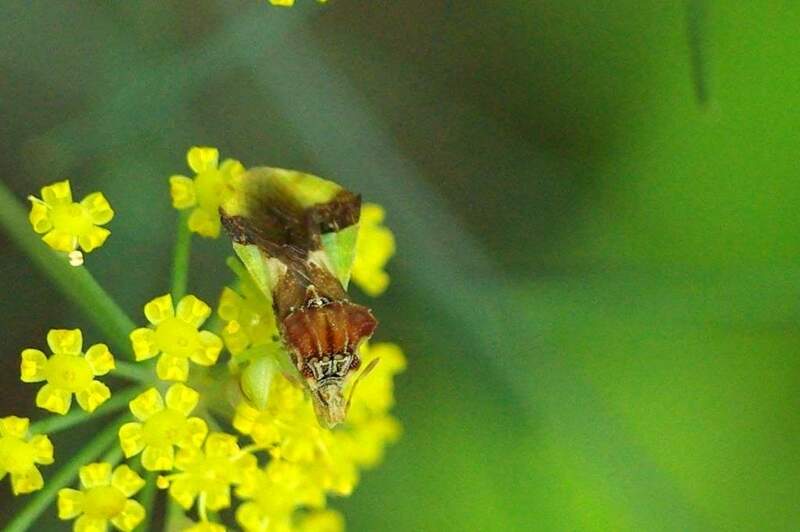 I took a few guesses and eventually found out that this is an ambush bug. I don't know the exact species, but really don't care. This is an amazing-looking bug! 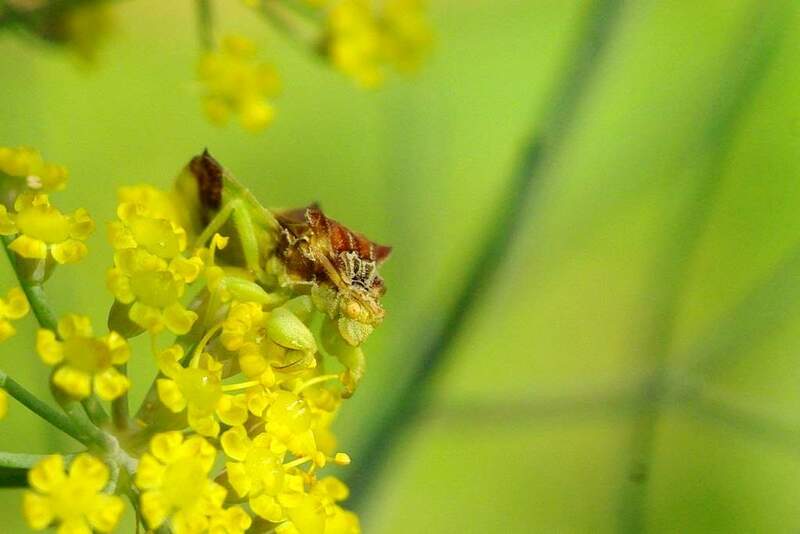 Ambush bug on fennel flowers. It is so difficult to tell where its body ends! 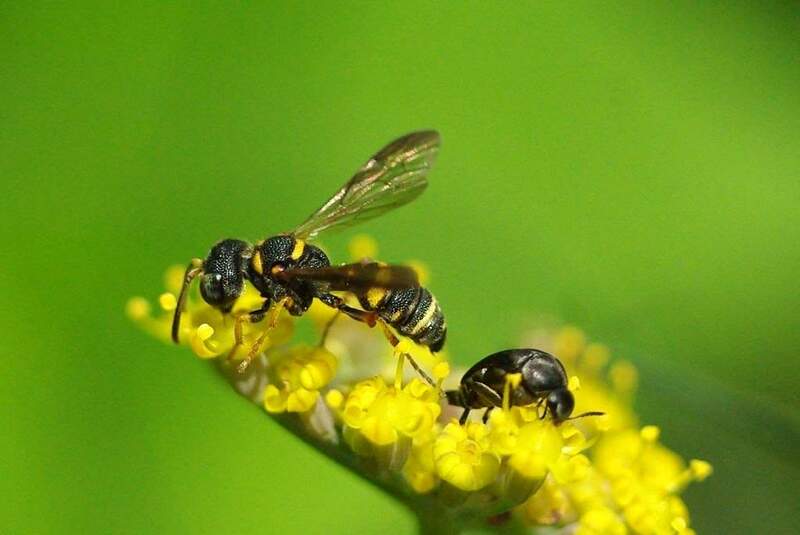 Are those bees or wasps? It's difficult to tell. There are dozens of them around these flowers though. That's when I knew it was time to call it a day and get out of the heat. 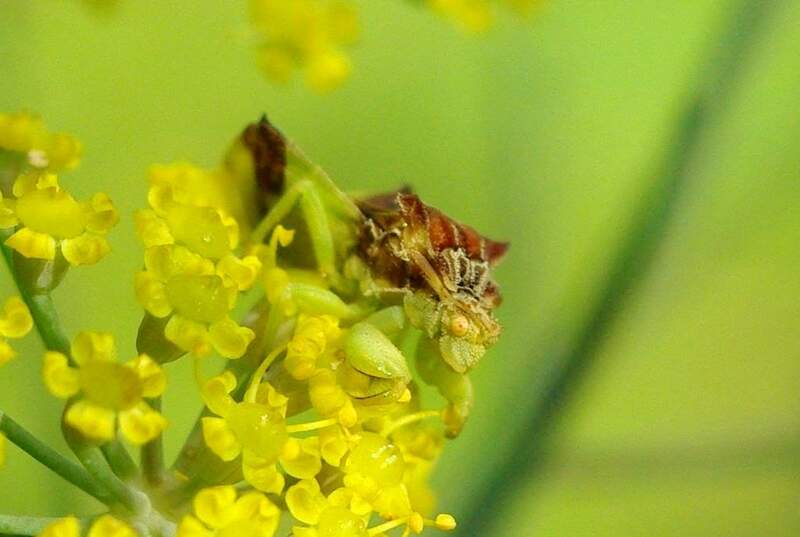 Ambush bug... what an excellent and exciting discovery! That is a serious looking bug !! 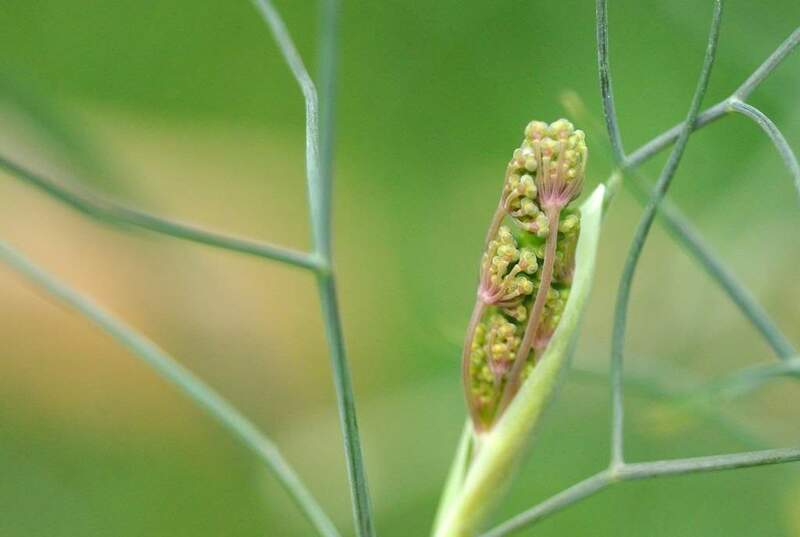 Love fennel in all its stages, do you use it in cooking or is it just to lure all the insects into your garden? Pauline: Haven't cooked with it yet, but love having it if we someday want it for that. Love the way it looks when younger, and definitely like that it attracts wildlife. Plus I love to nibble on it when I'm working in this area. I love discovering something new in the garden! Very cool. Those are definitely Wasps! The body shape and shiny front abdomen matches perfectly. No bee has such characteristics. 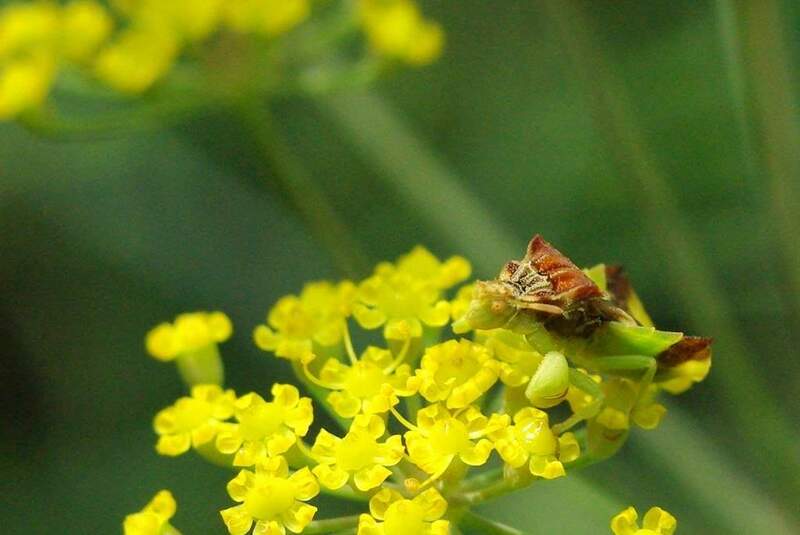 Bees have short front abdomens and usually very little markings and appear fuzzy. 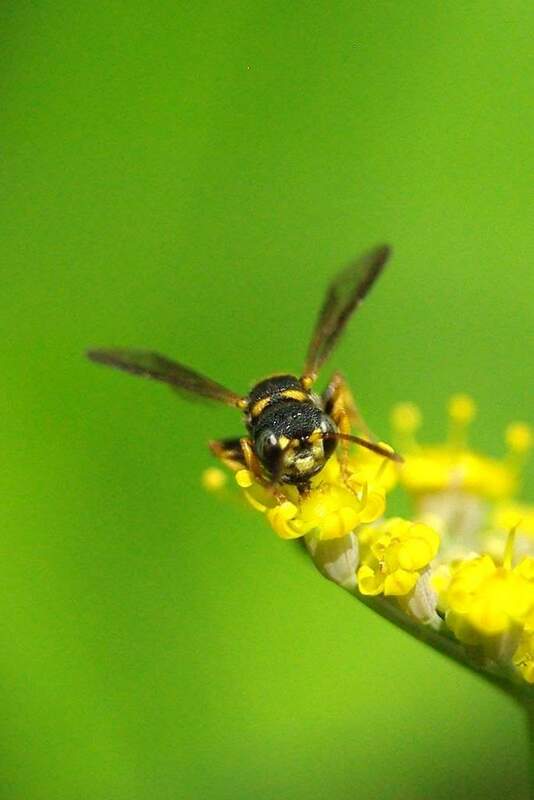 The thin middle part on a bee is very short but Wasps have an elongated thin middle. Their front is usually shiny with yellow markings as shown. 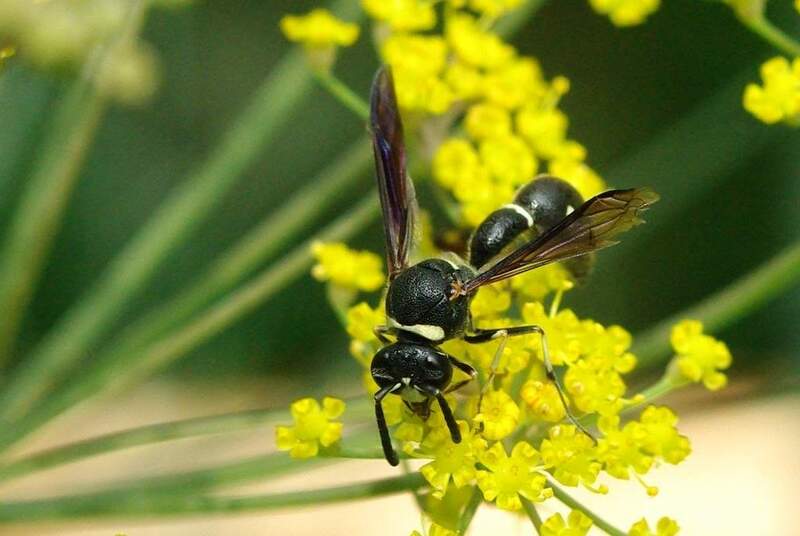 As far as eating, wasps do not hurt flowers but they will kill and eat bees. Find the nest and remove it. 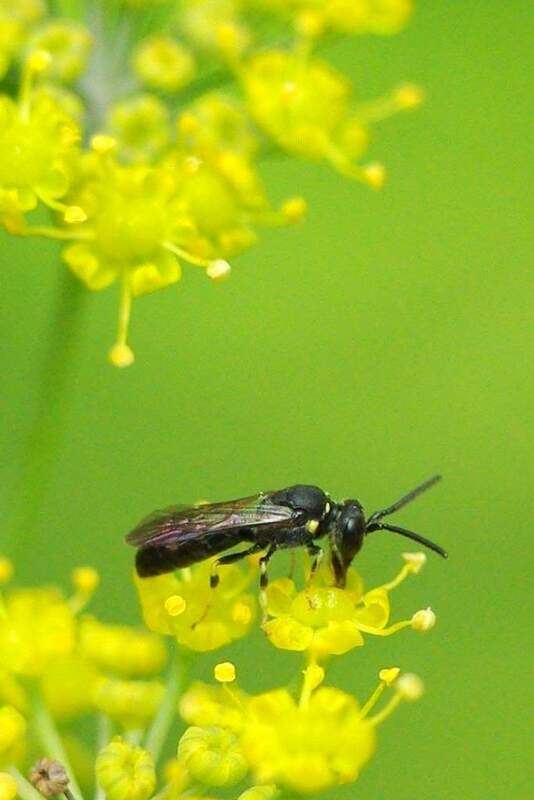 I just get Sweat Bees and Bumble Bees and some flies. My two plants are about 8 feet tall now.